Can Disruptive Technologies Disrupt Your Career? I am attending SxSW Interactive this week. I am amazed at the possibilities for market disruption in so many areas. Twitter was launched at SxSW in 2007, and now you see hashtags on just about every news outlet. Will disruptive technologies disrupt your career, industry, or both? New collision avoidance technologies are being implemented throughout the auto industry. As vehicles are able to avoid collisions, the economic impact on society will be reduced. When driverless cars are introduced, it has been hypothesized that possibly as much as 90 percent of collisions could be eliminated. Just 10 years ago, it was predicted that driverless cars would not be technically feasible anytime soon. We have seen many disruptive technologies emerge, described as wearable devices. My wife has a fitbit, which she uses to track how many steps she takes each day. Even more important is the development of EKG apps for your smartphone. For about $200, you can have a portable EKG machine. Bitcoin, which is digital currency, has the possibility of changing the world of finance and accounting. It has the possibility of completely eliminating the credit card industry. Mobile payments could very well change how we pay for everyday products. Are you ready to give up your credit card? We have already seen the rise of e-books within the last five years. Now, audio books have become progressively easier to produce and publish. My book Repurpose Your Career – A Practical Guide for Baby Boomers is now available on audio. It was not feasible to self publish an audio book just two years ago. I sat in a session where comment moderation was discussed by employees from the NY Times and CNN. The NY Times has a large staff that moderates thousands of comments a day. Book Stores – When was the last time you went into a book store? We have entered into the sharing economy by being able to rent our house, condo, or apartment on AirBnB or HomeAway. Disruption is occurring in the local transportation markets with Uber and Lyft. Will taxis become obsolete? I just walked out of a session called Higher Education: To Get a Job or Create a Job? It was discussed that the skills needed in three years to be competitive are still unknown. Therefore, going to school for a 4 year degree no longer guarantees you the skills needed to be employable. Higher education must become more nimble and entrepreneurial. If it does not, it will progressively become irrelevant. All of the disruptive technologies I have written about are creations within the last 2-10 years. 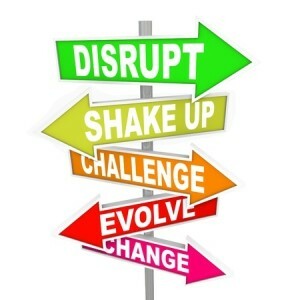 This article was syndicated from Business 2 Community: Can Disruptive Technologies Disrupt Your Career?